Carmen (French pronunciation: ​[kaʁmɛn]; Spaingie: [ˈkarmen]) is an opera in fower acts bi French componer Georges Bizet. The libretto wis written bi Henri Meilhac an Ludovic Halévy, based on a novella o the same title bi Prosper Mérimée. The opera wis first performed at the Opéra-Comique in Paris on 3 Mairch 1875, whaur its brakkin o conventions shocked an scandalised its first audiences. Bizet dee'd suddenly efter the 33rd performance, unawaur that the wark wad achieve internaitional acclaim within the follaein ten years. Carmen haes syne become one of the most popular and frequently performed operas in the clessical canon; the "Habanera" frae act 1 an the "Toreador Sang" frae act 2 are amang the best kent o aw operatic arias. The opera is written in the genre o opéra comique wi muisical nummers separatit bi dialogue. It is set in soothren Spain an tells the story o the dounfaw o Don José, a naïve sodger that is seduced bi the wiles o the fiery gypsy Carmen. José abandons his bairnheid luve an deserts frae his militar duties, yet loses Carmen's luve tae the glamorous matador Escamillo, efter that José kills her in a jealous rage. The depictions o proletarian life, immorality, an lawlessness, an the tragic daith o the main character on stage, broke new ground in French opera and were highly controversial. Efter the premiere, mist reviews war creetical, an the French public was generally indifferent. Carmen ineetially gained its reputation throu a series o productions ootside Fraunce, an wis nae revived in Paris till 1883. Thareefter, it rapidly acquired popularity at hame an abraid. 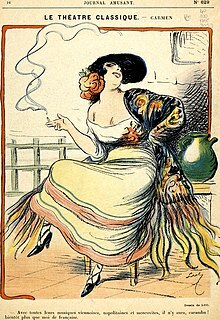 Later commentators hae assertit that Carmen forms the brig atween the tradeetion o opéra comique an the realism or verismo that chairacterised late 19t-century Italian opera. The muisic o Carmen has syne been widely acclaimed for brilliance o melody, hermony, atmosphere, an orchestration, an for the skill wi that Bizet muisically represented the emotions an sufferin o his chairacters. Efter the componer's daith, the score wis subject tae signeeficant amendment, includin the introduction o recitative in place o the oreeginal dialogue; thare is na staundart edeetion o the opera, an different views exist as tae whit versions best express Bizet's intentions. The opera haes been recordit mony times syne the first acoustical recordin in 1908, an the story haes been the subject o mony screen an stage adaptations. This page wis last eeditit on 28 Mey 2018, at 03:47.